AirAsia is the proud sponsor of this year’s Tigtigan Terakan Keng Dalan Festival in Balibago, Angeles City, Pampanga. This 2-day event happening today until Saturday, 28 October, is a music and street festival along the highway of Balibago where one can find various food stalls plus exciting performances from local celebrity bands that help keep the festivity alive. As the official airline partner of the festival, AirAsia will be raffling off flights to its newest destination - Clark to Caticlan (Boracay) which will be launched on 15 December 2017. 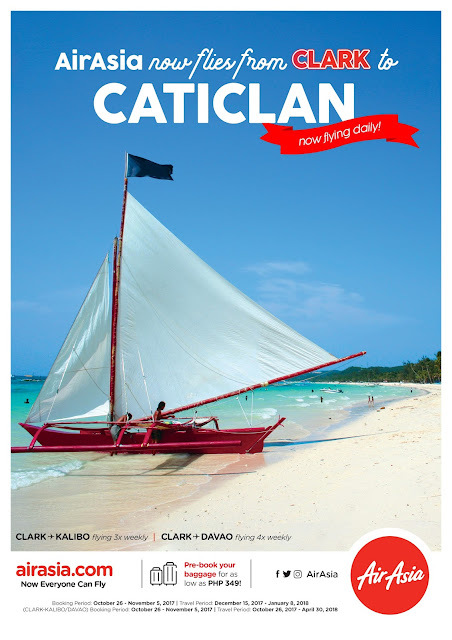 To celebrate AirAsia’s newest Clark – Caticlan (Boracay) route, all-in promo fares are available from as low as P2,366 from 26 October until 5 November 2017 and valid for travel starting 15 December to 8 January 2018. Book your flights at airasia.com and also available via AirAsia’s mobile app or visit our partner travel agents. “Our newest route from Clark International Airport to Caticlan (Boracay) reaffirms our commitment to make air travel more accessible and affordable to travellers from this side of the country,” Comendador added. AirAsia launched Clark-Kalibo and Clark-Davao back in March and April respectively. The airline which has been awarded the World’s Best Low Cost Carrier for nine consecutive years running by Skytrax since 2009 to 2017 said it will launch more flights from Clark International Airport very soon. AAP operates a fleet of 17 aircraft with domestic and international flights out of hubs in Manila, Cebu, and Kalibo. The airline operates several flights to/from Manila, Davao, Cebu, Kalibo, Caticlan (Boracay), Tacloban, Tagbilaran (Bohol), Puerto Princesa (Palawan), Clark, and Iloilo in the Philippines with international flights to/from Shanghai, Taipei, Incheon (Seoul), Hong Kong, Macau, Kuala Lumpur, Kota Kinabalu, Guangzhou, Vietnam, Indonesia, and Singapore.